Google has officially launched Nexus 5 smartphone that comes with a brand new version of Android operating system. The phone comes with 4.95 inch Full HD 1080p display with Gorilla Glass 2 protection and 1920x1080 pixels resolution. It runs on Android 4.4 Kitkat operating system and powered by 2.3 GHz Snapdragon 800 processor with 2 GB of RAM. 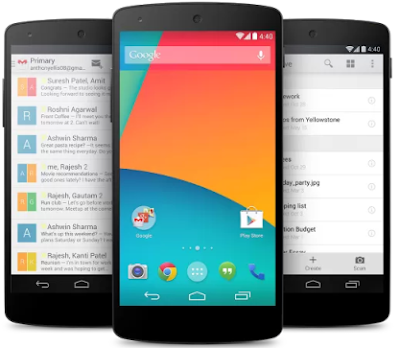 Nexus 5 comes with two variants, 16 GB and 32 GB internal storage and there are no external storage supported. The phone comes with a 8 MP rear camera with OIS feature and 1.3 MP front facing camera. It packs the 2300 mAh battery that gives 17 hours of talk time and it has the connectivity options of 4G LTE, Wi-Fi, NFC and Bluetooth 4.0. 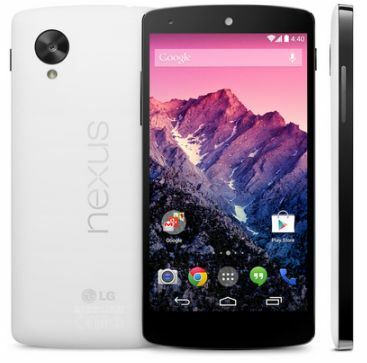 Nexus is made by Google partnership with LG mobiles and that is based on LG G2 smartphone. The back of the phone made with Silky plastic material, similar to Nexus 7 device and that is very soft to touch. It has also HDR+ mode camera feature that helps you take multiple photos with different exposure values. Nexus 5 comes in White and Black colors and priced at Rs.28999 for 16 GB model and Rs.32999 for 32 GB versions in India. The phone is now available on Indian Google Play Store. Also Google released bumper case and LG released Quick cover accessories for protection to the phone.